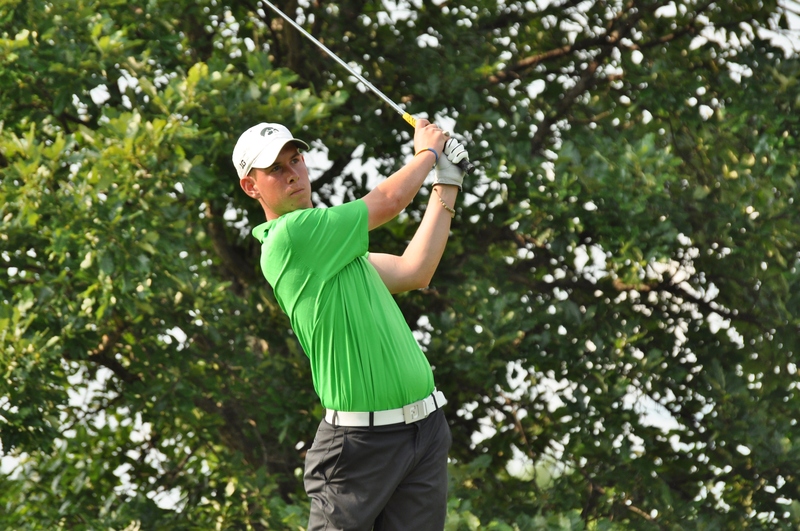 The reign of college players continued in the 84th Illinois State Amateur on Wednesday, but this time it took a four-hole playoff to decide the champion. Deer Park’s Chadd Slutzky, a 36-year old financial trader, took a two-shot lead into the 36-hole finale of the tournament at Cantigny, in Wheaton. He wilted, finishing solo fourth in his bid to become the first non-college winner since 2003. The championship was then decided in a duel of future Big Ten rivals. Naperville’s Ray Knoll (above), a sophomore-to-be at Iowa, outlasted Northbrook’s Nick Hardy, who enters Illinois in the fall. Hardy shot 66-69, the best scores in both the third and fourth rounds. That enabled him to finish 8-under-par 280 for the tourney’s 72 holes but the strong finish only got him into a playoff with Knoll, who has been on a golf marathon. He qualified for the PGA Tour’s John Deere Classic last week and played 39 holes in a failed bid to qualify for the U.S. Amateur in South Bend on Monday. He got the victory because of a bad drive hit by Hardy on the fourth extra hole. It sailed right, into a hazard. Hardy had to take a drop and struggled in with a double bogey six. Knoll’s drive was shorter and in the right rough, but he hit a 7-iron punch shot from 150 yards to within 15 feet of the hole,and got down in par for the victory. Knoll’s win came in the first playoff for the title since 2004 and was a popular one with the Cantigny staff. He started playing golf at Cantigny’s Youth Links when he was five years old. He continues to practice there but went four years without playing the course until a practice round prior to the State Am. Though he lives 10 minutes away from Cantigny, he plays most of his golf at Cress Creek in Naperville. Counting practice rounds Knolls played 257 holes in a 12-day stretch that ended on Thursday. He’ll take a weekend trip to Michigan Friday and Saturday, then play a Sunday practice round at The Glen Club in Glenview on Sunday in preparation for Monday’s start of the Illinois Open.